Tobacco pouches have been with us for a long time, not quite as long as tobacco itself, but discerning smokers knew that they enjoyed and derived greater pleasure more from new tobacco than they did from old stale products. Keeping the product fresh, preventing it from becoming tainted by overpowering smells became important and the tobacco pouch soon began to appear. Just as important today as it was then and keeping your newly prepared substances in top condition, especially when out and about is vital, and the W Pocket Mini Rolling Pouch will ensure that it does. This is an entirely new product and is both stylish and practical. 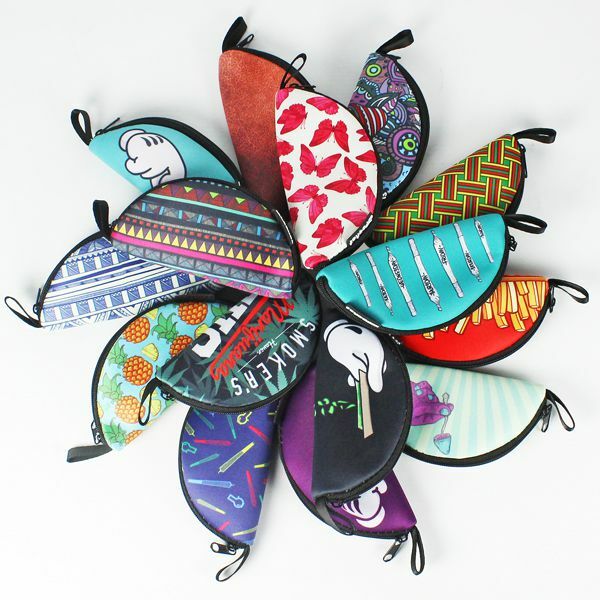 With the neat zipper users can comfortably and discreetly prepare roll ups whilst minimising loss, all due to the clever circle form made from a special non-stick, soft PU leather material, when zipped up after you have made your roll up, the contents will remain fresh and smell proof. With the thin and compact design, the W Pocket Mini is offered in a variety of designs, and with up to 15 to choose from, there is sure to be one that appeals to you, perfectly sized to fit into a pocket, thanks to the slim and compact design. For those who cannot chose between two or more, we are offering pouches in mix and match at two for just £11.99. We all need storage to keep the essential rolling papers, tobacco, blunts and herbal mixtures clean safe and stored at the exact humidity for us to enjoy our relaxing smoke; the battered old tin could be used, but Wolf Productions has something much better. What about a “cool” looking maple box that has four recessed magnets set into the base and lid, to ensure that the lid is held tightly to the body? Although the base has no recessed apartments, there is ample room to keep all your smoking items and when the lid is reversed and resting on the base, it makes a perfect rolling area. Because Wolf Productions take real pride in the simplicity of their products, but at the same time ensuring that they detail every one of their designs to the highest possible standard, both in the materials they use and in the finish that they deliver. 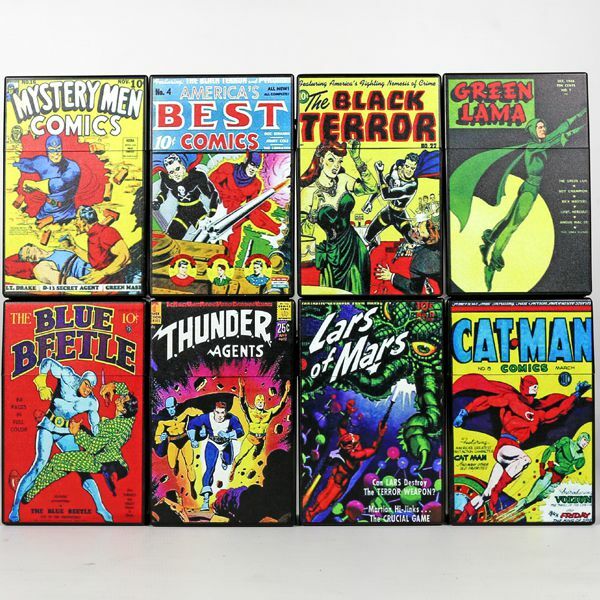 These superb items are all designed for the discerning smoker; we have to say that this storage box will not be out of place sitting on your coffee table or sideboard. 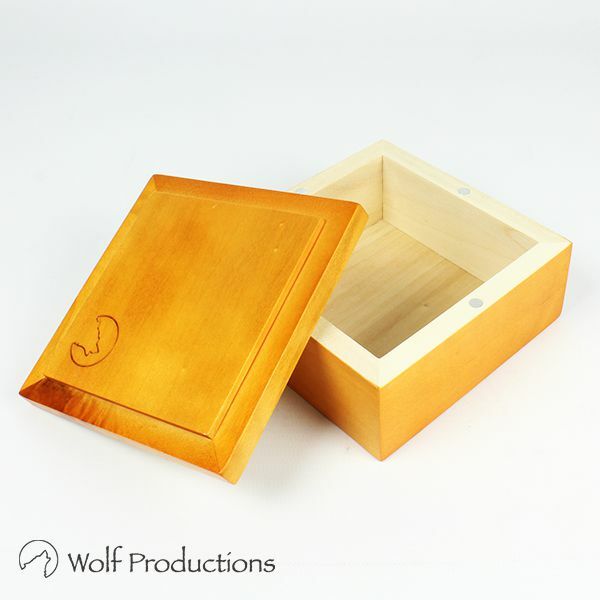 The maple wood not only looks great it also has properties that ensure that will help to maintain a constant humidity within the storage compartment, The Wolf Z1 2 Part Storage box measures 98mm (w) x 43mm (h) x 98mm (d) and we are offering this at only £13.99, we are sure that you will enjoy looking at, but more importantly using it. When you buy your favourite tobacco, it comes to you neatly packed, usually in a moisture proof wrapping most and ready for you to enjoy a smoke. There are a number of ways in which you can keep the tobacco fresh, but not all of them are easy to carry about, such as a battered old tin, but do you really want to produce an old OXO tin in front of friends? 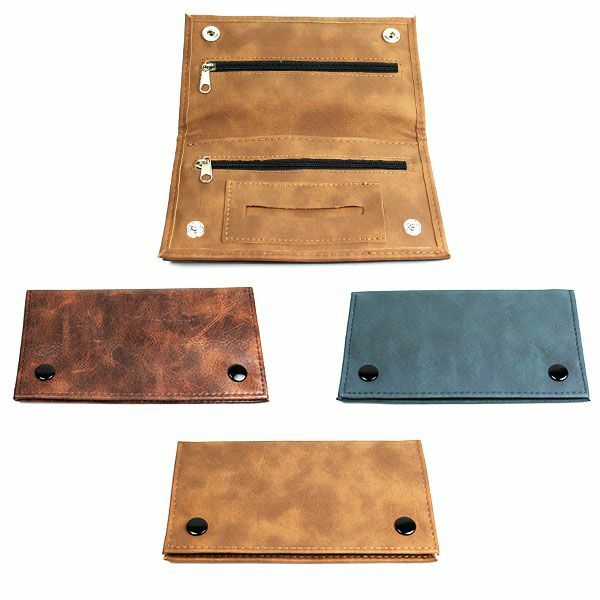 Why not keep your tobacco moist, fresh and at the same time keep all your smoking essentials together whilst looking really classy with a faux leather tobacco pouch. 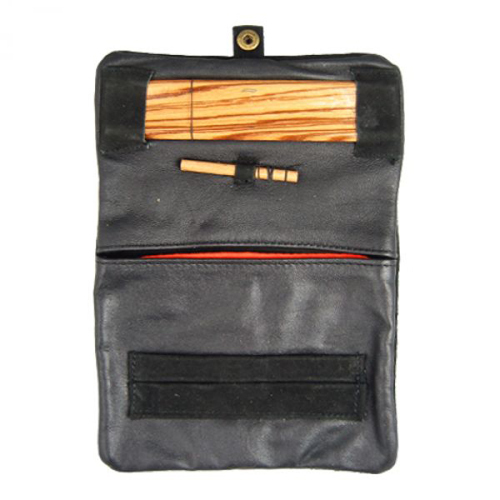 The pouches are made from realistic faux leather, lined with PTFE to keep your tobacco fresh, plus they also have a neat feature which will hold papers, with a zip lock pouch and magnets to keep it neatly sealed together and we are offering these in three colours, Tan, Gr­­ey or Brown, with genuine looking markings, just like real leather for just £7.99. Are you at a loss to find that gift for a friend or partner, well take a look at some of these useful and neatly designed tobacco pouches? 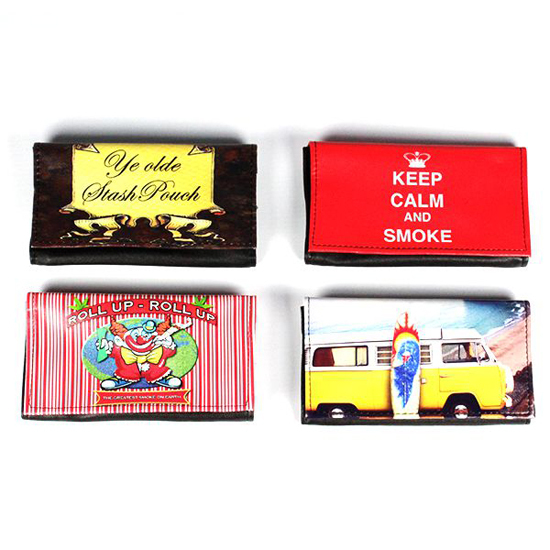 The printed design tobacco pouches have always been a big hit with our customers and the six designs can be perfect for someone that you know. Ye old stash pouch, say no more, no tobacco kept in here overnight, does he drive a security van, perhaps the jester would suit the “joker” that you know, keep calm and carry on for the laid back member of your circle, roll up roll up for someone who just loves doing that, and for the guy or gal who spends their time meeting like-minded enthusiasts, the VW camper van. 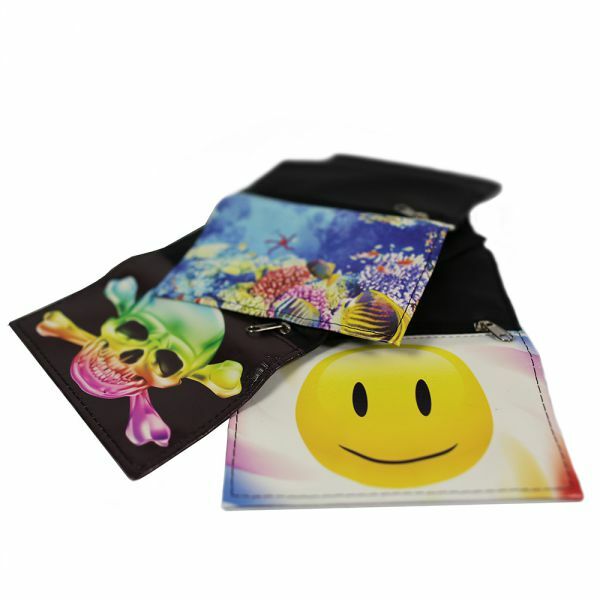 The tobacco pouches feature a neat magnetic locking system and has a lining that will ensure that you tobacco is always kept in mint condition. A convenient pocket for keeping your papers, at the back is a zip lock pocket where you can keep your lighter or some money and the appearance is realistic looking faux leather and is offered by us at just £4.99, perfect for an added stocking filler, or anytime gift. Buying rolling tobacco as opposed to manufactured cigarettes is a great way of saving and there are a number of ways in which you can keep your tobacco fresh as the day it was bought, buying a small quantity will ensure that you smoke the tobacco before it becomes dry, but at we all know this is a more expensive way to buy rolling tobacco, it is much cheaper to buy it in bulk. Keeping the bulk product fresh could be a problem, but we have a number of inexpensive products that will ensure that your tobacco remains fresh and good to smoke, because as you will know, smoking old dry tobacco loses its taste. Now what we would suggest that you do is to split your bulk tobacco into smaller amounts so it can be stored more easily, you can even keep it in a freezer if you have a lot and are not likely to use if for some time. We have a number of 1oz and 2oz tins as well as traditional tobacco pouches, the tins are particularly useful for keeping small amounts of tobacco, or even used to store a load of pre-rolled cigarettes, they will fit nicely in the pocket or bag. Because they are airtight they will always keep your tobacco or herbal product fresh. Many people prefer rolling tobacco than standard cigarettes because of the taste, but rolling your own cigarettes is a skill that takes time to master. For those who don’t have the time or patience to roll their own, but still want the hand rolled taste, the Black Automatic Rolling Box will have you making perfectly rolled cigarettes in no time. Simple and easy to use, the Black Automatic Rolling Box also doubles as a tin to keep all of your rolling accessories safe and secure in between smokes. 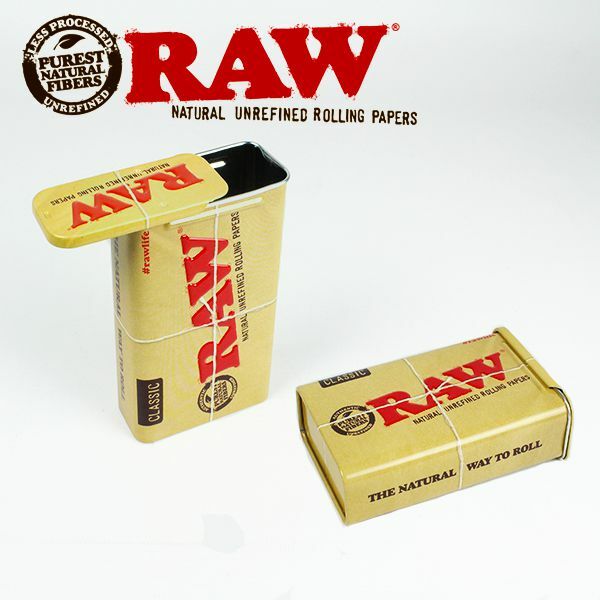 To use, simply open up the box and fill the channel with your favourite tobacco, next moisten the gum line of the rolling paper and place at the top edge of the tobacco with the gum line facing out. Gently close the lid and watch in amazement as a perfectly rolled cigarette pops out of the top of the box. 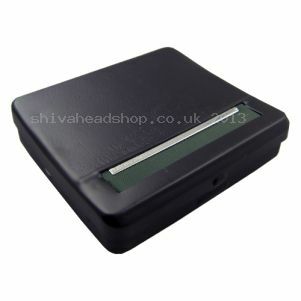 The Black Automatic Rolling Box is available now for just £7.99 and makes an ideal gift for any smoker.